When it comes to eating and drinking in the Alps, it’s good to know your grappa from your grostl. At the very least this will prevent any days on the slopes wasted with a pounding hangover. We round up the very best mountain cuisine that Europe has to offer. This is the lunch to order if you have no intention of moving in the afternoon. If the pound of potatoes doesn’t get you, the wheel of cheese will. Browned lardons of smoked bacon, onion and garlic, and waxy, skin-on sliced spuds (tartifla in the Savoie dialect), are topped with a whole creamy, nutty reblochon cheese. Far from being a dish that grand’meres have been passing down the generations, tartiflette appeared in Tarantaise resorts in the 1980s, after a marketing push by the Syndicat Interprofessionnel du Reblochon. Recipes can differ, but the big question is whether the cheese rind should be on or off. We recommend on, which results in a cracking crispy lid to the dish. Usually, cailloux are to be avoided on a piste – they are pebbles. But in your soup, they’re surprisingly beneficial. Essentially, this is a hearty vegetable potage cooked with a couple of round rocks that roll around, mixing and squashing the veg – like a natural Magimix. Let’s clear up a common debate. Don’t trust Google to translate myrtilles. They’re not blueberries in the fat, sugary, American sense; they are bilberries (or blaeberries to Scots) – smaller and more acidic, making for a truly tart tarte with crisp pastry and vanilla custard. Sometimes blended with the fruitier (and more famous) Gamay or Pinot Noir, this Savoyard grape deserves more respect. A deep plum colour and redolent of a pine forest on the nose, it tends to be tannic, spicy and herbal, with bitter cherry notes. This sweet, green aromatic liqueur, which is similar to absinthe, is not to everyone’s taste but, at its best (ie lovingly made to a family recipe, with wormwood and other herbs and plants found in a secret spot every summer), it makes a fine end to a meal. 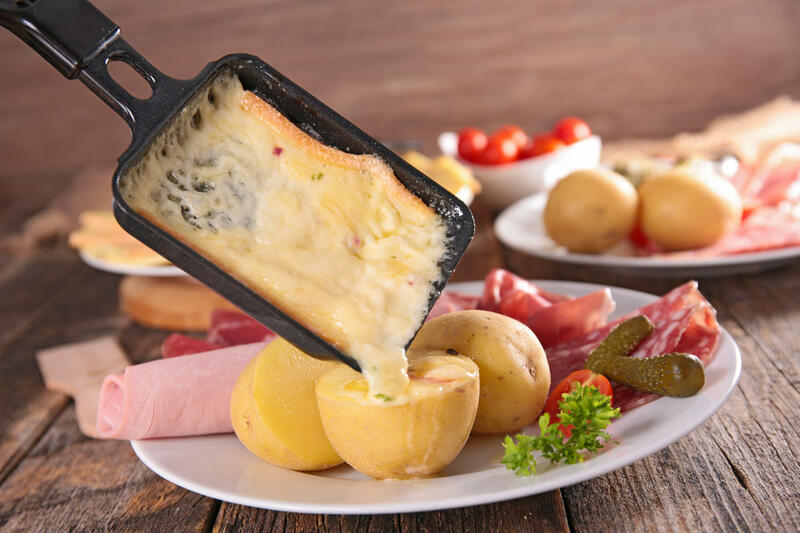 Of all the fromage-filled dishes of the Alps, raclette is the most cheese-worshipping – and the most convivial. The name comes from the French racler (to scrape), but the dish is also known in Swiss-German as bratchas (roasted cheese). Which is what it is – half a wheel of semi-soft cheese, the cut side pointed towards a heat lamp or an open fire. As the cheese melts and browns, you scrape it on to a plate on which you’ve piled boiled potatoes from a basket lined with a kind of spud cosy. It is accompanied by cornichons (mini gherkins) and tiny pickled silverskin onions to counter the richness of the cheese, and by charcuterie – notably bundnerfleisch, a cured and air-dried beef. To many, a proper Swiss rosti is the ultimate expression of the potato – it has the golden crispness of chips, the earthy flavour of boiled spuds and the buttery richness of mash. Nothing else should be in the rosti but anything can go on top. Best is a spiegelei – a sunny-side-up egg ready to ooze through the potato. Since macaroni cheese has made a foodie fashion resurgence (albeit under the American name mac’n’cheese), it’s worth trying this Swiss version. The pasta (usually penne) is bulked out with potato and topped with crispy, caramelised onion. The dish is accompanied by cinnamon-spiced apple sauce. The Valais region’s finest grape produces complex white wines with notes of grapefruit and lime (without being overly acidic), and balancing honey notes, and a wonderfully floral bouquet. Switzerland produces the two finest (in other words, least rough!) schnapps/or eaux de vie in the Alps. One is the cherry schnapps kirsch, which deserves more respect than being poured in a fondue. But Williamine, made from pears, comes from the Valais, and is the skiers’ shot of choice. Italy prefers the grain for its carbohydrate needs and northern Italy has its own speciality, made from cornmeal – polenta. It can be a bland slop if care isn’t taken, but done right – slow-cooked from fresh – it serves as a deliciously buttery, slightly granular base for rich toppings such as slow-cooked venison, a beef or pork ragu, porcini mushrooms, or (in the Aosta valley) Fontina cheese. The golden variety is the most common and benefits from the addition of herbs or garlic, but the paler Veneto variety has a delicate flavour that doesn’t need enhancement. For many people, polenta is at its best as leftovers, when it hardens and can be grilled, giving it lovely caramelised stripes. Italy is not short of charcuterie but arguably king of them all is the cured, air-dried beef from Valtellina, home to the resorts Bormio and Livigno. Salted and rubbed with spices, lean beef is hung for three months to develop a deep red hue and tender sweetness. It goes well with a red radicchio di Treviso salad. Across Italy there are dishes called 'priest stranglers' (Italians have an interesting relationship with the church). In Trentino they take the form of spinach dumplings, made using milk-soaked bread and flour, with sage and nutmeg. Like giant gnocchi, they are much softer and lighter than many dumplings. The perfect accompaniment to game, beef and cheese, this grape, native to Trentino and the Sudtirol, is full-bodied and earthy. Bursting with plum and cherry flavours, it’s so deep purple it could play Smoke On The Water. The craft ale revolution has reached Italy. In Aosta, Birrificio’s roster is led by 50 Ale, while its neighbouring brewery, B63, has a range named after musical styles. Oppale, from Veneto’s 32 Via Dei Birrai brewery, is highly recommended and Forst, in Trentino, makes the notable Heller Bock and Sixtus. This article was written by Chris Madigan from The Daily Telegraph and was legally licensed through the NewsCred publisher network.